We met with the staff Tuesday and had a blood draw. They like to track the numbers of genetically modified cells wandering around in my blood. They don't have results yet but they did tell us that measuring peripheral blood is not a good indicator. 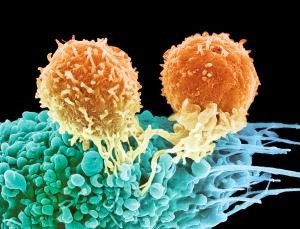 Apparently the T-cells cluster in the spleen, liver and especially around the targeted tumor. So the ones wandering around in the blood are just kind of like scouts looking for any stray cancer cells that might have gotten away. Except for Sunday when I felt a little flu like, I have been feeling great. I have a tumor in the temple area that bulges out a little. During chemotherapy that bulge diminished a bit and became softer. After the T-cell infusion the bump enlarged a little but it is still pretty soft. My jaw seems swollen too. I have had an increase in pain as well. When we visited with the doctor yesterday she seemed quite encouraged by the swelling. As she said "I hope that means it is working". 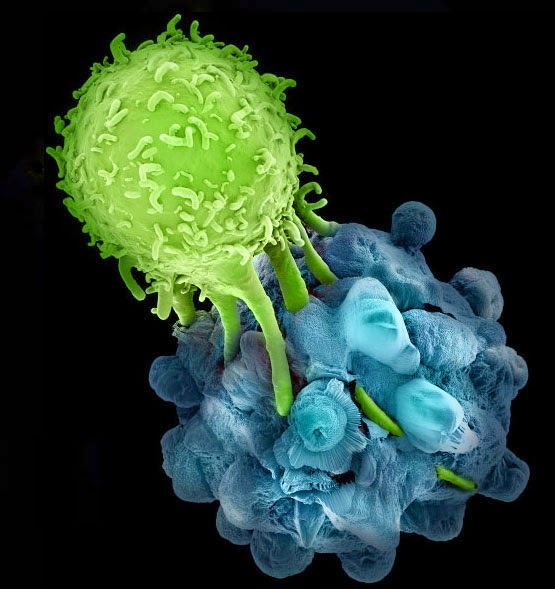 And now two T cell on the attack. It's interesting when we first met with her she was very low key about the study. It is after all a phase one trial, that is the very earliest type of trial. Really nothing has been proven at that point. During our first meeting she was very careful to downplay any expectations we might have. She kept saying things like "This is a dosage trial, we aren't really expecting to cure anybody" and things like that. Now that we are in the study and doing so well, she is almost giddy. She keeps crossing her fingers and smiling a lot. Needless to say, we have been hopeful all along. We know who is really in charge and that He can choose to perform a miracle when and where He pleases. I think I have mentioned before how much trouble I have had gaining weight. I had never really tracked my calories until now. It suddenly becomes apparent to me how little I had been eating. Now that I am paying attention and eating more I am doing much better. I gained 8 pounds this week. Pretty impressive. Of course JoLynne is making milk shakes with ingredients like, Ice cream, peanut butter, whole milk, muscle protein powder. 1.5 cups has over 600 calories. Yummy! To bad I can't taste it. I have been exercising about an hour a day so most of the weight gain seems to be muscle. That is nice. I was looking kind of like a POW there for a while. It's nice to get some muscle back. Thank you again for your prayers and your faith. We miss being home and hope to be there again soon. We're praying harder than ever for you! Thanks for the updates! Thank you Weldon. We are praying too. We're praying for you too! Keep up the good work. Good to hear you are putting on some lbs. But what the heck,,, gotta get the taste back!! Those milk shakes,,,You know if you will get back your taste and how long it will take? Hoping to have you guys back soon. After being at your office with my Phil it makes me want to come out of retirement.